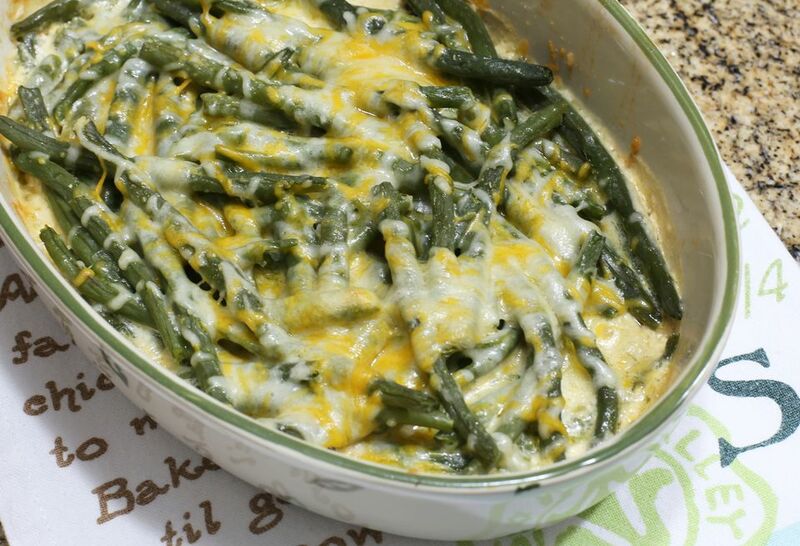 These green beans are creamy and cheesy, and they make a fabulous side dish for any meal. They're super easy, too. The green beans are gussied up with a small amount of heavy cream and some shredded cheese. If you're tired of the same plain old steamed veggies, try this recipe. This recipe uses cooked green beans. That allows you to start with either fresh green beans or frozen. With fresh green beans, clean them and trim the ends. Steam them in a steamer or the microwave until they are the desired doneness. Cook frozen green beans according to the package directions. You could use canned green beans if you like soft green beans. Fresh green beans are in season during the summer, which might be surprising since they are so traditional as a side dish during the winter and holidays. They are easy to grow in your garden, either the bush varieties or pole beans. Browse a farmers market during the summer to see different heirloom varieties for this vegetable. Some have stripes or surprising colors. Butter a shallow baking dish. Add the cooked beans to the dish. Sprinkle with salt, cayenne pepper, and 1/2 cup of the shredded cheese; dot with half of the butter, then pour cream over all. Stir to blend ingredients. Sprinkle remaining cheese over the green beans and dot with remaining butter. Bake at 400 F for 20 minutes, or until hot and bubbly. Serve the green beans hot and enjoy! Green beans add color to the plate and so they are an excellent vegetable to serve with roasted chicken, fish, or pork and starches such as mashed potatoes or rice. Refrigerate any leftovers and use them within the next three to four days. You can also freeze leftovers. For the best quality, eat them within two to three months. Green beans by themselves are low in calories and high in fiber. They also have a good amount of vitamin C.
You can spice up the green beans by adding more cayenne pepper flakes or hot sauce. Add garlic powder or crushed garlic to the beans before baking. Add onion powder or sauteed onions before baking. If you miss the crunchy French fried onions or buttered breadcrumbs of green bean casserole, simply add those to the top while baking. Use a pepper jack cheese instead of cheddar for more spice. For more intense flavor, use crumbled blue cheese or gorgonzola. Add pimientos or diced sweet red peppers for an extra burst of flavor and more color.